11:40 – 12:00 GRAND PARIS EXPRESS – Строительство новой кольцевой линии метро в Париже. 17:20 – 17:40 Двухсводчатая станция метрополитена – передовые технологии, конструкторская мысль, экономическое обоснование. После конференции состоялось награждение победителей конкурса “На лучшее применение передовых технологий при строительстве тоннелей и подземных сооружений”. Лауреатами конкурса стали: АО “Мосинжпроект”, ОАО “Метрострой СПб”, ОАО “Минскметропроект”, ОАО “Ленметрогипротранс”, АО “Мосметрострой”. Арутюнян А.В. – главный инженер УП “Минскметрострой”, Чеканов В.В. – ОАО “Минскметропроект”. We would like to remind you that the abstract submission deadline for the 14th International Conference entitled “Underground Construction Prague 2019” is on September 30, 2018. Guidelines for the submission and the link to the online abstract submission form is available on the Conference website. 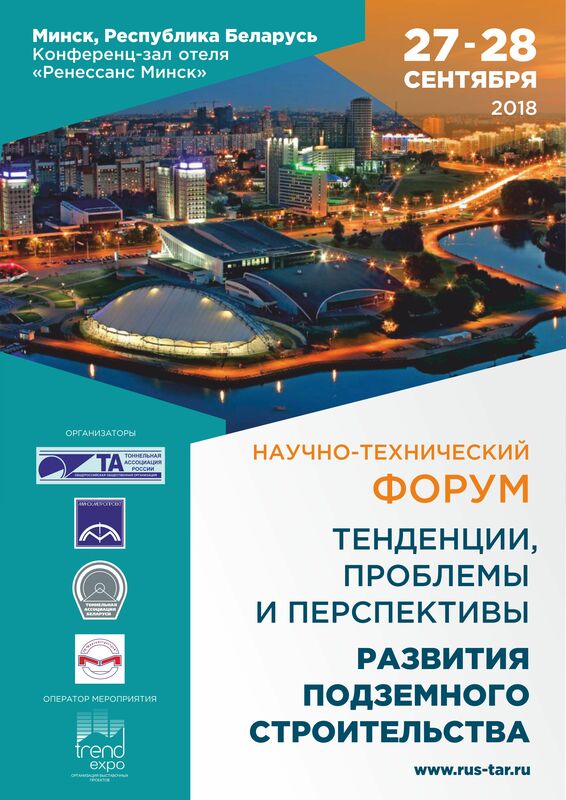 Scientific and technical forum “Tendencies, problems and prospects for the development of underground construction” will be held in the conference hall of the Renaissance Minsk from September 27 to September 28, 2018. Study of the shield panel in under-construction Vokzalnaya station area. At the same time a technical conference on the topic “Tunnels” under the initiative of a group of young engineers was held on the basis of Minskmetroproekt JSC. For reference: The events held by a group of young engineers have educational and auxiliary nature and pursue its ultimate goal – the development and increase of the intellectual level of young professionals – employees of Belarusian Tunneling Association members. World Tunnel Congress-2016 and the 42nd General Assembly of the International Tunneling and Underground Space Association were held in San Francisco, California (USA) from April 22 to April 28, 2016. Visiting the Faculty of Design, La Sapienza San Pietro in Vincoli and Rome. Under the agreement at the General Assembly of Eastern European countries in Athens on September 28, 2014, at the end of September 2015 Belarusian Tunneling Association organized and conducted a technical tour at the underground infrastructure facilities of Minsk. The event took place on September 23 and 24, 2015. Representatives of Greece, Hungary and the Czech Republic visited Minsk.